When there are days at a time that I know I won't be getting to my sewing machine, or have much of a chance on the needles, or in a sketchbook, or *some* kind of creative outlet, I start to get a little twitchy. These are the days when I'll grab at any little thing to get my fix on. Such was the case with this tea tray. It starts innocent enough...I was drawing with Ezra, and spotting Adelaide out of the corner of my eye as she unloaded dishes from 'her' kitchen dishwasher to 'my' dishwasher. I saw her pick up this thrifted wooden tray and was reminded of the ugly cornucopia painted on it - and just like that, the creative synapses started jumping at the bit. I looked at Ezra drawing his animals. I looked back at the ugly tray. Starting to get a bit excited, I survey the scene. Can I do it? is there time? Calvin's in the other room with what appears to be several more stacks of construction paper to go before his cannon is complete. Sweet. And Adelaide has a basket full of dishes to go. 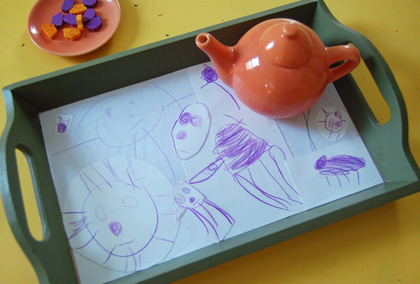 "So Ezra....," I say, sidling up with probably crazy eyes, "wanna draw me some animals and I'll make them into a new tea tray for you? huh? huh? wanna?". Thankfully, the answer is an enthusiastic yes, and it's less than a minute before the mod podge is out, brush and scissors in hand, and I'm moving with a mission. Ezra and I chat about his animals (the horse in a cradle being my favorite) as I slap the glue on and paste them into the tray, layered on top of one another rather hastily. Moving with speed and fervor, the tray is complete, the brush makes it's way into the sink, the paper scraps into the trash, and the Mod Podge back in the cabinet just as the entertainment value of the dishwasher has run it's course, and a marble comes shooting out of the cannon towards my head. Granted, it's not the slow, thoughtful and detailed creative work that is so enjoyable. But sometimes, the rushed little fixes are all I can get. And I'll gladly take them. And Ezra loves his tea tray just the same.